Join Our March Madness Challenge! Making Healthy Skills A Lifestyle! We are going to start a new challenge in March to help everyone begin creating new skills! Maybe you need an extra push to help keep your New Year Intentions or want to make better choices. The main point of this challenge is to help each other build healthy skills to a point where it becomes a lifestyle. We’ll begin on Sunday, March 5 and end on Saturday, April 1. Learn more and join this event by simply becoming a member in our closed Open Sky Fitness Facebook Group. Without even realizing it, our eating habits may have been passed down to us from our grandparents and parents. What we ate as a child and maybe even now can go generations back. Fortunately, we have the awesome opportunity to stop the poor nutrition pattern and transition into making healthier choices. 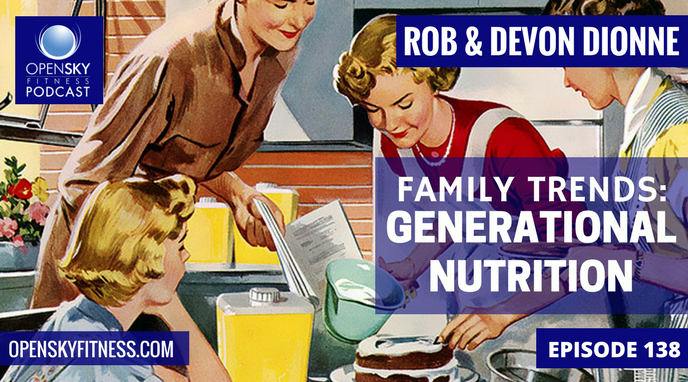 On this week’s episode of Open Sky Fitness, Rob and Devon discuss generational nutrition. Children pay a lot of attention to what their parents do including what they eat and their relationship with food. Today, Rob and Devon explore how parents can be a positive or negative influence on their child’s future eating habits. However, parents also have to ability to improve their family’s health. Learn what simple changes parents can make to help the entire family become healthy and how to teach their child to make good choices. How Do Families Begin Poor Eating Habits? Our nutrition habits might not only be based on what our grandparents cooked for our parents. Time and convenience can play a huge role as well. In a two-parent household where both parents work or a single-parent household, no one may have the time or energy to buy ingredients, prepare the meal, and clean up the plates. That’s when convenient foods like ordering out pizza or picking up fast food can become part of the regular routine. We can easily associate food with good memories or bad memories. A good memory might be baking cookies with your mom or watching someone prepare a delicious meal. A bad memory could be a parent who decides to drink alcohol or eat their emotions rather than deal with their problems and properly take care of themselves. Child learn from watching and listening to what they parents say. So depending on the relationship that our parents had with food and beverages, we may either have the same relationship or we’ve been impacted in a different manner. If your parent was controlling, you may become controlling as well and especially around food. If you didn’t feel loved, you may feel that you don’t deserve love and so you deprive yourself of food. Whether your parents may have felt happy, depressed, or mad through out their lives, you might have picked up on the same attitude. If your parents were “fatphobic” (meaning they believed fat people were less than they were), you may have tried to avoid gaining weight at all costs out of fear that they wouldn’t love you anymore. How Can We Become Healthy for Life? To start, don’t be too hard on yourself because none of this is your fault. You may not have received the right information about health when you were younger, but now you can take action and turn your life around. CHECK OUT OUR BATCH COOKING SHOW! Each Saturday at 2pm PST you can join us for our batch cooking show! Last week we made chicken salad, chicken bone broth, and two different kinds of roasted almonds: spicy roasted and chile lime roasted almonds. These two dishes and 1 snack all in just 35 minutes! To watch and learn how to make these easy, healthy meals each Saturday, just join our Open Sky Fitness Podcast group. Why batch cooking? It’s a great way to prepare for the week by making nutritious, delicious meals in advance. In fact, this food should last you around 3-4 days! 2:30 Join our March Madness Challenge! 12:00 New information can be exhausting, but you have to be willing to make the change. 14:00 Rob’s nutrition and typical dinner when he was a child. 17:10 How do families begin to create these habits and what are they? 32:00 How do we change the course and start feeling valuable and that we deserve to be healthy? Check out our March Madness Challenge! Watch the OSF Batch Cooking Show! Thanks for listening/reading Episode 138: Family Trends: Generational Nutrition! We hope you have gained more knowledge on how to be a healthier you!